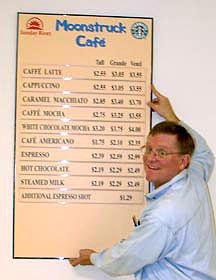 We can produce poster size menu boards on styrene, sintra, foamcore, gatorboard, coroplast, and 50 point board. Call us to discuss your project and we'll help you choose the right material for your menu board application. We'll get it done on time, on budget, and beautifully! Our state of the art facility includes a complete prepress shop, 19 wide format printers of up to 60" width, and a complete finishing shop for laminating and mounting your menu on board. 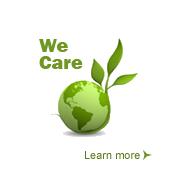 We can also print directly on board with UV curable inks that are waterproof, light stabe, and durable. 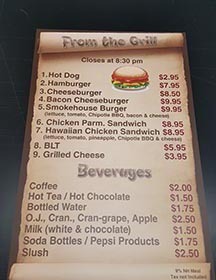 We have the skill, and the capacity, to turn your menu board job around quickly and affordably. We are large enough to have the right people and equipment to do your menu board job well. We are small enough to give your job the personal attention to be sure it's done right. Give us a try - we'll make you happy! !